The Opportunity Hub is the council’s creative space which connects the borough's business community with local people looking for opportunities including training, apprenticeships, work placements and paid employment. On a daily basis there are workshops, training and recruitment sessions alongside our highly skilled team of information, advice and guidance advisors who are happy to help with any enquiries if you pop in. The space is designed to be used for a number of different uses including team bonding, meetings, launches and panel discussions, pop in to see the space and discuss further. 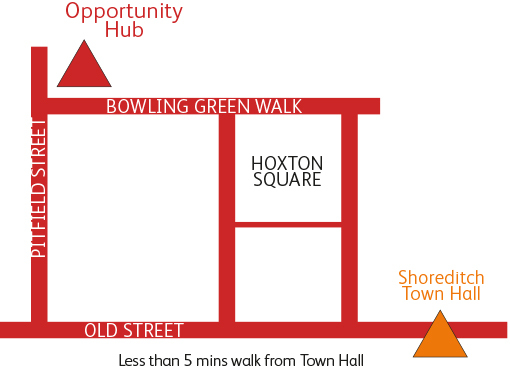 What is on offer at the hub? Immediate Theatre, St Giles Trust, Hackney Homes, CIPD, Women Like Us, Circle 33 and Affinity Sutton.